The Saints who left a profound impression on humankind and the Church did so because they discovered a new dimension to Christianity, a new way of living the message of Jesus, a new way of reading the Gospel. Even when times change, that way will continue to be valid. St. Vincent did not see holiness as some direct path that led to God, but rather as a path that moved in one direction, then another direction and still another… from one poor person to another poor person until one encountered God. Today, especially in the Western world, many people fit into the category of “spiritual but not religious”, even disenfranchised. But they come to volunteer, they come to us because they want to serve the poor– that’s their entry point. Social ministry is the part of the faith life that makes sense to them. Service is a meeting point. Evangelization cannot be limited to announcing the Word but must be realized in deeds. Living the faith in acts of charity can protect us against temptation and lets us see the truths of faith with clarity. Christ identified Himself with the poor and the only way to love Him effectively is by loving our neighbor and making our neighbor love Jesus Christ. When everyone sees persons who devote themselves to the service of those who are poor, they are bound to admit that God is good. We are each in a personal relationship with divine holiness but we are also in relationship with the holiness of the community. Since few people seem to have had a personal experience of God, it is necessary that Christian education include an initiation into mystical experience, prayer and meditation. St. Vincent saw a multitude of poor peasants and laborers “who are condemned for not knowing the necessary truths of salvation and for lack of confession.” He decided to make the evangelization of the poor the focal point of his priesthood. He began to organize popular missions (almost 1,000 missions at the house of Saint-Lazare) and soon realized that the priests themselves did not know enough about the faith to offer spiritual assistance either (for example, some did not know the words of absolution, etc.). So Vincent established seminaries and organized retreats for ordinands. St. Vincent was also an influential promoter of the lay apostolate for the rich and educated: he founded the Ladies of Charity, and between 1635 and 1660 some 20,000 individuals made their retreat at Saint-Lazare (counts, nobles, lawyers, councilors, marquises, presidents, members of Parliament, soldiers, judges, merchants, pages, and footmen). During these times, St. Vincent suffered terribly. Something like the dark night of the soul described by St. John of the Cross overcame him. He could not recite the Creed. He wrote down the Creed and sewed it on the lining of his cassock. He told himself that every time he put his hands over it, he wanted to reaffirm his faith. At the same time, he devoted himself to acts that were contrary to the urging of the temptation: living the faith in intense acts of charity through daily visits to the sick in the hospital. And this way of living brought him to the greatest discovery of his life: the decision to devote his whole life to the service of the poor, out of love for Our Lord Jesus Christ. Scarcely had he made up his mind to do this when the suggestions of the evil one vanished. Thus this individual who had up to that time been a priest with no great ideals became a saint. Oh happy dark night! When Vincent told others about his crisis of faith and how he overcame it, he did this to bring them to use similar remedies and to obtain relief in the trials they were undergoing. During his two years of captivity in Tunis, Vincent was surrounded by people who were convinced that Christianity was harmful. This is not that different from our own situation where we find ourselves surrounded by indifference. Vincent not only persevered in his faith, but helped his master, who had made a decision to embrace Islam, return to the Christian faith. St. Vincent brought religious women out of the walls and grills of the convent and sent them out to the vast field of the real life of men and women, to serve in authentic communion with them in their sufferings and needs. This new style of community was destined for a splendid future in the Church. 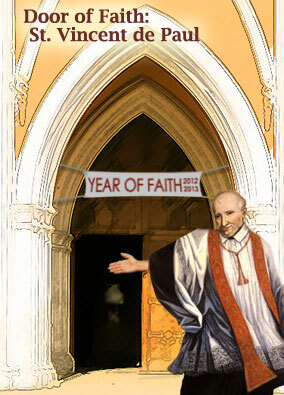 St. Vincent always needed to assure himself that his faith was the faith of the Church. One day he explained to the Missionaries that “all my life I have been afraid of finding myself at the start of some heresy […] enveloped in the errors of some new doctrine before realizing it.” Thus we can understand Vincent’s opposition to Jansenism, a heresy at the time. As a member of the Council of Conscience, he struggled resolutely against this doctrine. He played an important role in Pope Innocent’s condemnation of the five propositions of Jansenism. Vincent believed that holiness, union with God, could only be achieved through love. God is Love, and the human person is able to love with the divine love that has been poured out into our hearts through the Holy Spirit (Romans 5:5). This reality led Vincent to the affirmation that the important aspect of holiness was not simply doing the will of God, but rather doing the will of God out of love for God. Human holiness for St. Vincent is an encounter of human love with divine love in the person of the poor. Vincent and the Church in His Time – Luigi Mezzadri, C.M. Religious Experience of St. Vincent – José María Román, C.M. Faith of St. Vincent in the Midst of an Unbelieving Society – Luis González-Carvajal Santabárbara, C.M. The Holiness of St. Vincent dePaul – Benito Martínez Betanzos, C.M. The Spiritual Journey of Vincent – Vinícius Augusto Ribeiro Teixeira, C.M.